This Month’s Book: Let’s Eat! ¡A comer! Our Cover to Cover Book of the Month for November is Let’s Eat! ¡A comer! by Pat Mora. 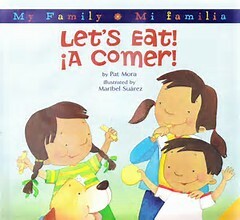 Enjoy this wonderful bilingual books that brings family together is one of the most fabulous ways, FOOD! Let’s Eat! ¡A comer! by Pat Mora is a wonderful book that encompasses the importance of family and food and the gratitude felt when those two are combined! While reading, talk to your child about why the characters feel “rich.” What does it mean to feel rich in the context of the book? Tell your child what makes your feel grateful and then ask them about times in their lives when they have felt grateful. In Let’s Eat! ¡A comer! Grandma gets to join dinner! Even the dog comes to the table, or at least under the table. While reading, point out all the different members of the family and then talk to your child about all the members that create your beautiful, unique family. Just like eating , art can be a great way to bring the family together. Provide your child with simple materials such as crayons, paints, chalk and paper, and as a family create beautiful art! Create recycled art! Next time you are grocery shopping ask for paper grocery bags and allow your children to use them as canvases! The cardboard from cereal boxes also make great canvases. Your child will be so excited to create art with you! Send a picture of you and your family creating art together. Be creative! We can’t wait to see what you loved about Let’s Eat! ¡A comer!